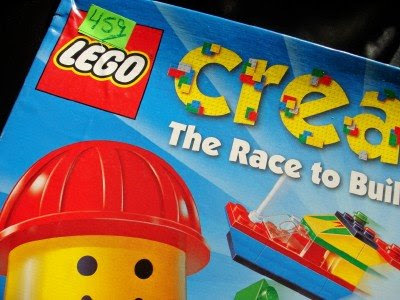 We paid $3 more than I usually would for this thrift store Lego board game. I knew we'd get our money's worth for decoration. I placed the cake stand on top of the colorful board. Those bright Lego colors coordinate with basic paper plates (20 for $1 from Dollar Tree). We strung several of the instruction cards in a banner across our mantel. The best part: we'll enjoy the game long after the party is over! 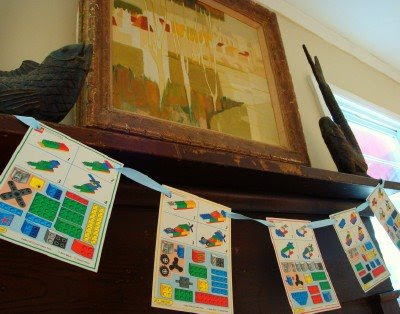 Click here for Lego invitations, cake, activities and other ideas for planning the ultimate LEGO birthday party! Whoa! I added the Amazon link in case anyone needed details on the Lego board game. It is apparently collectible and sells for $60 (used) and $259 new! Now I've completely devalued it. Something else to look for at your next yard sale, right? 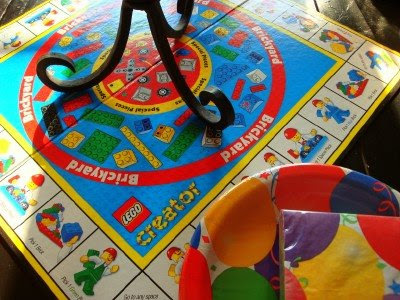 There are plenty of newer Lego board games you could also use for decoration. You are enjoying the game -- isn't that its real value? Oops! But it was a great decoration idea!! A fantastic use of a thirft store find! So smart. Once again, I'm amazed at your creative use of an ordinary item. I love birthday themes that are "out of the box," so to speak, and this one stacks up nicely. I'm out of witty Leggo phrases -- oh, wait, guess that means I'm blocked, so I had one more in me. So I'll close, but not without saying, great party! I love how you used the game pieces for decoration! And the game is a good one, I'm sure your son will enjoy it. What a neat idea! I found your blog through Stephanie at Built to Last. My parents would have a COW about what you (oops) did to the game--they are antique collectors and my Dad specializes in Vintage books and games! Too funny. That is so fun....creative, too! SO cute...I love the banner! ack! $60 used on Ebay? I think we have that game somewhere! ... or had. Love how you put the board under the cake stand. I love your level of creativity. Thank you for sharing a GREAT idea. I love how you strung up the cards. Of course, that's too bad now that you found out you could have made some good money on it. But, what can you do? Right? It's in the past now, and you had very cool party decorations! Bake a cake in a 9x13 pan, and bake some cupcakes. Cut the 9x13 cake in half and stack (you'll have a taller 9x6.5" cake. Cut the tops off 4-6 cupcakes (depending on size) and arrange upside down. Frost! Holy cow! I can't believe it was worth that much! That is crazy! You always find the best thrift deals. This is such a great idea. Impressed me again! Your kids are blessed! Aside from the loss (sorry about that!) I think this is a wonderful idea! It is so adaptable for other games too. Now I'm dreaming up all kinds of ideas for our extra Candyland for my daughter's 2nd birthday party. Thanks for the inspiration!! Adorable - I love the banner! Thanks for stopping by to comment! I know your days are super full! I really enjoyed getting to finally meet you at BlissDom even though we only live 45 minutes away in real life. I'm glad you like my egg paintings...they were very fun to paint! That looked great! Another possibility for the banner without punching holes would be those tiny little wooden clothespins, I think I got mine at Jo-Ann Fabric & Crafts and use them to display greeting cards on ribbons. Thanks for the ideas, I've got a pirate birthday coming up. I love the banner! So creative, even if it was a valuable collectible! I have a question for you regarding kid's birthdays. I'm wondering if there is a polite way to ask invitees to give secondhand gifts? My son's birthday is coming up and I would love to ask people to bring a used book as a gift, but I've always felt that "telling" someone what to bring was a bit rude. What do you think? Note to self: always check value on eBay before altering items. What you did is very cute, though! I LOVE this idea. I have a 6 year olds birthday right around the corner, and this would be perfect!